Mastichari is located 22 kilometers west from Kos town. Its small port links Kos to Kalimnos which is exactly on the opposite side and its beach is now a modern tourist resort. One of its main characteristic features includes the ruins of the old, Early Christian Basilica with its beautiful mosaic floor only a short distance from sea. There are several accommodation alternatives around the area. In Mastichari visitors apart from peace and quiet can also find good food served at the very popular fish houses which are only 20-30 meters from the beach and offer fresh fish and many delicious seafood dishes. Lets not forget to mention that Mastichari is very popular for its fresh fish as many fishermen have their fishing base here which means probably whatever is served on the table has just been caught in the morning. Mastichari beaches are characterized by white sand and turquoise waters which create the impression of being in an exotic place, just like the ones you find in the Pacific Ocean. Visitors can have a swim, enjoy the sun and have lots of fun at the various water sports available in this well organized beach. Many people claim that Mastichari has the best beach and the best sea in the whole of Kos. On the road going to Mastichari you can find a Water Park and for those looking for something more private the beach has a few remote spots to enjoy. Mastichari beach is also popular for its beautiful sunset view, again claimed to be probably the best on the island. Windsurfing fans, will find Mastichari’s waters ideal for the sport, due to its big waves and for those new to the sport there is a windsurfing school available. The local festival takes place on the 29th of August in honour of Agios Ioannis (St. John), an unforgettable event to take back with you once you return from your holidays. Medical emergencies can be looked after at the local Medical Centre of Antimachia, (3-4 kilometres south) where you will also find a Police Station. 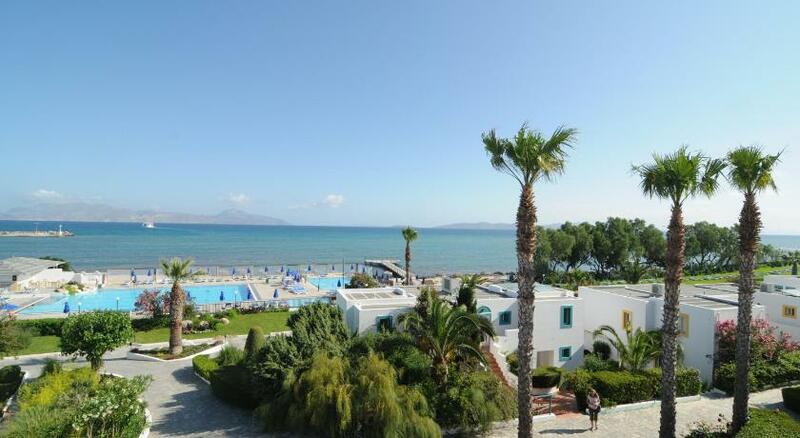 Access from Kos town is easy (22 kilometres) by public buses, by taxi and by car and motorbike. From Mastichari’s port you may visit Kalimnos, the boats depart regularly every day and if you have a yacht, the small port is available for mooring. Ilios and Irene air-conditioned apartments are set in a garden of bougainvilleas and roses, 400 metres from Mastichari Beach.